The Red Check Stocking features a creamy white background with an ever-popular cranberry and tan plaid. The timeless color combination is sure to complement your existing Christmas decor and create a simplified, down-home look for your country farmhouse this year and for many years to come. Reverses to the same plaid fabric and the cuff is finished in a natural burlap with miniature jingle bells giving it a sweet, festive detail. Equally at home hanging from a mantel, doorknob or tied to the back of a rustic chair, you'll find multiple ways to display this holiday accent. Well-crafted and generously sized, it can be filled with ample goodies, gifts, candies, or faux greens to help bring in the true Christmas spirit. 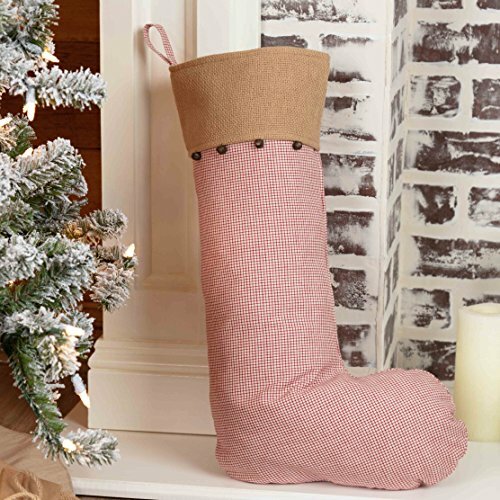 Opening 8.75", length 20", heel to toe 12"
The Red Check Stocking features a creamy white background with an ever-popular cranberry and tan plaid. Reverses to same red check. The cuff is finished in a natural burlap with miniature jingle bells giving it a sweet, festive detail. Lined with soft white satin. Generously sized to hold lots of Christmas goodies! Pack of 2 Country Rustic Burlap Stocking Container Christmas Decorations 22"